- a ring B behind the seat for fixing the upper strap, referred to as the T op Tether. 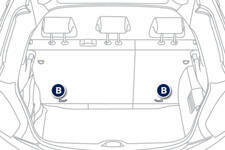 When fitting an ISOFIX child seat to the left hand rear seat, before fitting the seat, first move the centre rear seat belt towards the middle of the vehicle, so as to avoid the seat interfering with the operation of the seat belt. 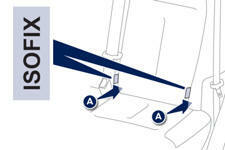 The ISOFIX child seats are fitted with two latches which are secured on the two rings A. Some seats also have an upper strap, known as the Top Tether, which is attached to ring B. To attach this strap, raise or remove the vehicle seat's head restraint then pass the strap over the backrest. Attach the strap by its hook on ring B and then fully tighten the upper strap.